Shadows on construction drawings … who would do such a thing?!? As it turns out, I would. I thought adding shadows to these elevations would help convey some additional information and despite the fact that I know you should never add shadows to construction drawings, I’m doing it anyways. Why? Because there are a lot of things that I am willing to try in an effort to get a better built project. I’ll be the first to admit that I don’t know everything (that’s pretty magnanimous of me, don’t you think? To admit that I don’t know everything??) but I am not afraid to branch out and try new things. But I’ll get to the shadows in a minute. For those of you that want to tell me how wrong I am, go ahead and skip down to the comment section. If you use your grownup words to tell me how wrong I am, you don’t have to worry about me deleting your comment. My Wisconsin project broke ground last week and if the project follows the proposed construction schedule, this project will be done by June next year. I am about to start the process of migrating the wrong direction in winter since I’ll fly out from Dallas, Texas and head North to Madison, Wisconsin – rent a car – and then drive for another 3 1/2 hours even further North. This project will be my first true project where I’ll be able to do a little ice-fishing after my job site visits. Yikes! I can already tell you that I don’t have the proper job site clothing to wear for this sort of weather. 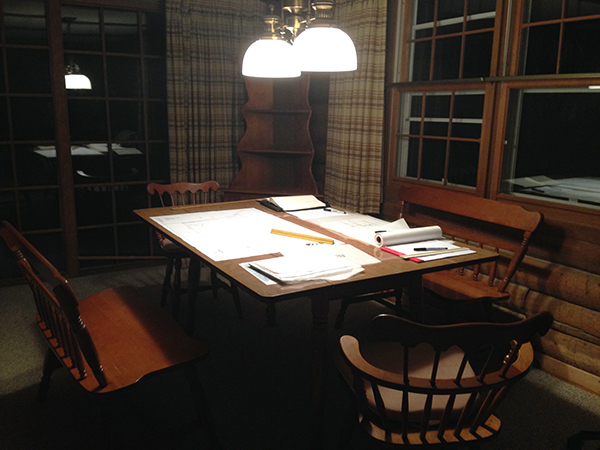 Let’s talk about the elephant in the room … Yes, I’m showing shadows in my construction drawings. It’s typically unheard of, almost unilaterally frowned upon, and I’ll admit that up until this particular project, I have never EVER shown them in my construction drawings before. For the last 25 years I’ve been parroting all the reasons why you should never show shadows in your construction drawings, mostly because contractors don’t build shadows. I would also tell you that it isn’t outside the realm of possibility that the contractor could mistake your shadows for a secondary material and that what you think looks like shadow, in fact, looks like a pattern to someone else. But hey, I’m a 47-is-the-new-27 year old dog trying to learn a few news tricks and this time around, I am going to indicate some shadows in my exterior elevations. GASP!! This is one of the working sketches I prepared for this project (actually sitting at this desk) and if you compare it to the “closer to the finished product” elevation down below, you can see that it’s not too far off. The massing on this project is pretty straightforward, despite the fact that this project is not particularly straightforward. 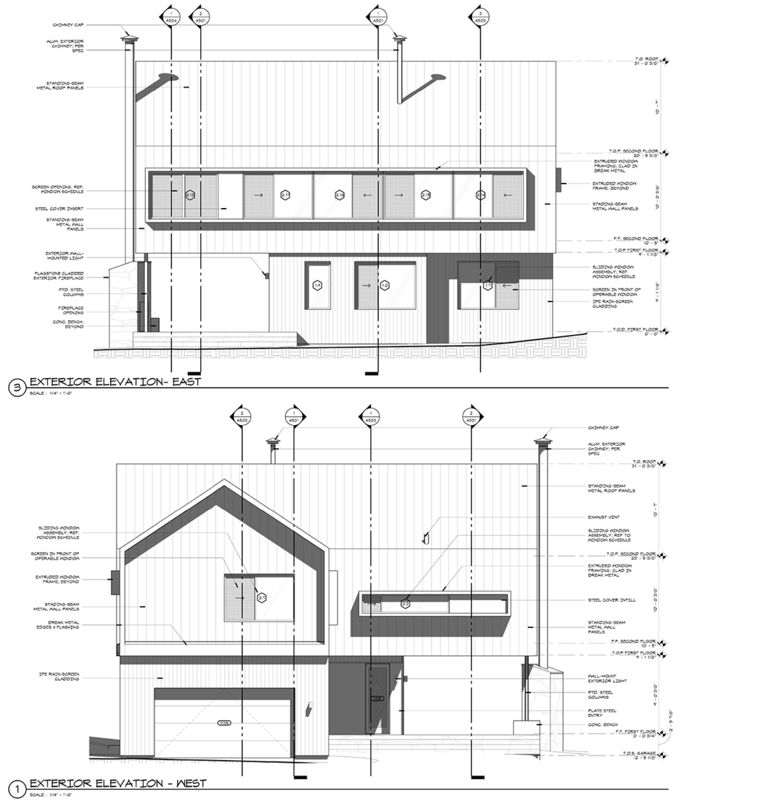 When we started distributing the exterior elevations to the other team members (owners and contractor) for comment and discussion, the relatively simple box forms were proving a challenge to read – despite the effort we put in using various line weights. As a result, we started sending out the elevations in two versions … those with shadows and those without. Guess which ones everybody responded to in a more meaningful way? If we hadn’t gone through this process, I can confidently say that we would still be issuing our construction drawings without shadows. All the other residential projects in our office will still be issued without shadows – this project required some special consideration. The contractor so far has been really receptive to what we are trying to do here but they don’t have much experience building homes like this – most have been of the “log-home” variety. If this is a step that can help the people working on this project understand it better, count me in because I like to think I am a team player and I’m trying to prove to myself that I can still remain flexible in my methodologies. As a bonus – and since it supports the idea of trying new things, I thought I would include a few window details from this project. 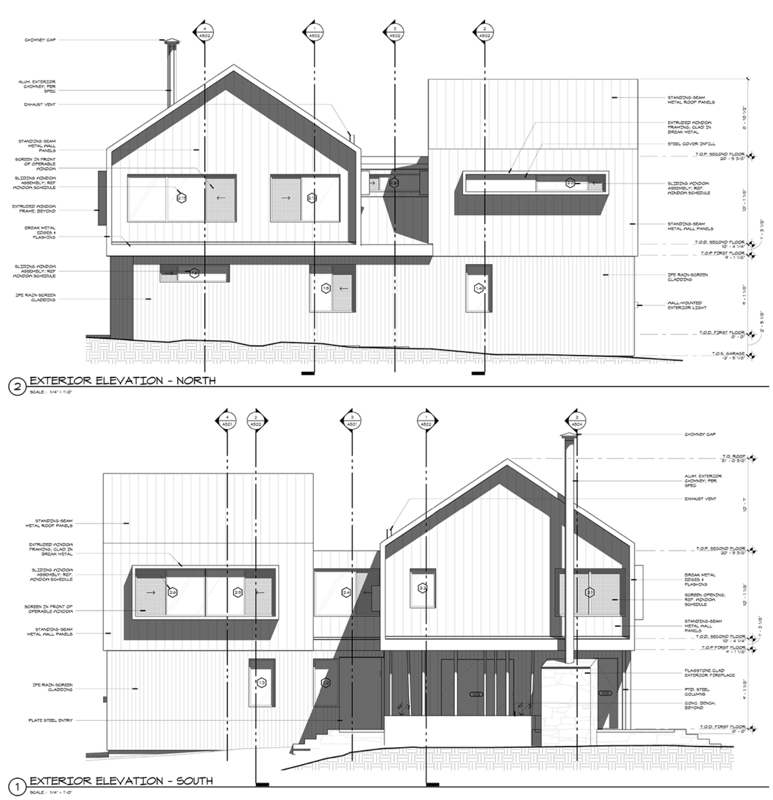 One part of the design feature on the exterior elevations is the large framed out windows. The building masses are simple extruded forms and whenever we have large windows along the axis of the extrusion, we have “boxed” out the windows to accentuate the form and to help provide some vertical protection since the building doesn’t have an overhang on these elevations. The entire second floor is clad in metal siding and we have been developing details to maintain that cladding where the window pop-outs occur. Why is this included in a post about trying new things? Everything about these details is new to us – new window manufacturer, new metal cladding manufacturer – and I’ve never done window pop-outs on a project before. If I break it down in to small enough pieces, there isn’t anything in here that I truly haven’t done before … but in this configuration? I’m just an old dog trying to learn some new tricks – it’s a state of mind that I hope never I never lose. I fully expect to be crucified by others for indicating shadows in my construction drawings. I also fully expect to get comments on how my details should change with people sharing their lessons learned. I’m okay with that – although, all of these images were taken from the redline set that I spent my weekend reviewing (other than the time I spent putting this post together). In fact, it was because I was redlining these drawings that I thought I should write this post – it’s how most of my posts get created. This project just broke ground last week and the basement foundation walls are going in next week – the development of these drawings is happening almost as quickly as we can feed the information to the contractor. Speaking of which, I had better get back to work.